Sears Holdings announced earlier this afternoon that it plans to close about 100 “non-profitable” stores. Of those stores, 72 will begin closing sales soon, with all stores expected to close by the end of the third quarter. In metro Atlanta, three Sears stores are slated for closure including those at Northlake Mall in Tucker, Gwinnett Place Mall in Duluth and Southlake Mall in Morrow. Sales at the affected stores in metro Atlanta are expected to begin in about two weeks according to employees at the local stores. The Sears Auto Centers at the Tucker, Duluth and Morrow malls are expected to close in "late July" according to the company's official release. Following the closure, Gwinnett Place Mall will be left with Macy's, Beauty Master and Mega Mart as its three anchors. The mall, which since 2013 has been owned by Moonbeam Capital Investments, has had its fair share of bad luck as of late - from closures to killings - but its recent use as a film set for the hit Netflix show Stranger Things made it popular again, if only for a week. Moonbeam, whose website indicates that they have "corporate offices" in Las Vegas (condo), New York (shared office space) and Atlanta (Gwinnett Place Mall), has dragged their feet on doing much of anything in the way of improvements at the mall and its wishful thinking to imagine the closure of Sears will do much to move the needle. Northlake Mall, which was purchased by Dallas-based ATR Corinth in late 2016, lost Kohl's in 2016 and following the Sears closure, will be anchored by Macy's and JCPenney. Plans for the mall remain "in the works" with "strong interest" from a variety of new tenants, but ATR has been tight-lipped on who exactly may be part of the mall's second life. Southlake Mall, purchased by Los Angeles-based Vintage Real Estate in 2014, will be left with only Macy's as anchor when Sears closes. The mall, built in 1976, was originally anchored by Rich's, Davison's, Sears, and JCPenney. Although the mall has struggled in recent years, it maintains a stable of over 40 national tenants, more than Northlake Mall and Gwinnett Place combined. Last year, Southlake added both F21 RED, a concept store from Forever 21, and H&M, both new stores to the mall, indicating the confidence some retailers have in the mall and the greater Morrow market. 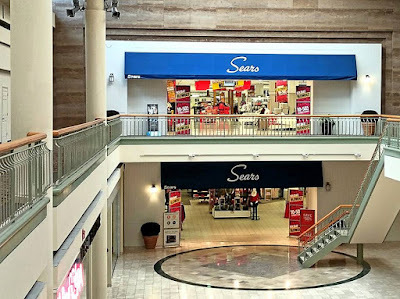 ToNeTo Atlanta reported earlier this month that Sears is actively liquidating their store at North Point Mall in Alpharetta, part of a previous quietly announced 40 store closure expected to conclude by late July. Following the three closures in metro Atlanta, Sears will have just one store inside the perimeter (ITP), Cumberland Mall in Smyrna, which is situated along I-285, just inside the perimeter. The company will continue to operate just eight full-service Sears stores in Georgia, including those in Cumberland Mall, Town Center at Cobb in Kennesaw, Arbor Place in Douglasville, Oglethorpe Mall in Savannah, Glynn Place Mall in Brunswick, Augusta Mall in Augusta, Georgia Square Mall in Athens and Lakeshore Mall in Gainesville. Sears, which started both Allstate Insurance and Discover Card, shed those businesses long ago to focus on its retail operations. The company has in recent years sold off its respected Craftsman tools line to Stanley Black & Decker and spun off a large chunk of its real estate holdings (Seritage Growth Properties) to keep its retail hopes alive. As of May 5, Sears Holdings, based in Hoffman Estates, Illinois, operated 529 Sears stores and 365 Kmart stores. Are you surprised by the stores Sears plans to close locally? Do you think Sears will manage to survive as a leaner, more focused company? What could Sears do to bring customers back? Eli, I like the new "You might also like"...I'm not sure how it works but it seems to be relevant somehow. I've had the thought for a while that it would be great to have Google Maps integration (i.e. see mentioned locations on a map.) Ideally you could even see this on the main page or browse all articles on the map. Sears will actually still have one ITP store remaining, as Cumberland Mall is located just barely inside the Perimeter, with I-285 forming one of the property boundaries for the mall property. I’m not surprised at all that the Gwinnett location is closing, but a little surprised that the Tucker location is on the list. Gwinnett Place seems years away from any redevelopment and the area continues to decline. However, there does seem to be a little energy around the Northlake area and thought Sears might stick it out. It seems to me that Sears occupies a bad place in the retail hierarchy sort of slight above Walmart, but slightly below Macy’s. The reality is that Sears isn’t a bad store, but their competitors are just more attractive. On a personal note I remember shopping at Sears at Northlake as a child with my parents and then alone as a teenager. However, even than other retailers and other malls like Lenox or Perimeter held more appeal. The Northpoint Mall store is closing in early July. I went there recently to return a Lands' End order and everything was on sale/clearance. Sorry to see Sears close their Northlake store since it has been very convenient. However, no surprise since Northlake mall has been in decline for years. Perhaps part of the problem is with reliability at Sears. I just purchased a Wet/Dry Vacuum at the Northlake closeout for "20% off" and paid $76.49. The listed regular price at Sears.com for the vacuum is 89.99 which means the "sales" charge should have been 71.99, or $4.50 less. Furthermore, it is currently available online with free shipping for 68.08. Not much of a bargain - caveat emptor. Even Sears employees have mentioned that prices are better online; physical locations may become uncommon before long.